Faithful Thinkers- Defending God's Existence and Compatibility of Science with God and the Bible: What Is The Intellectual Cost of The Pro-Choice Position? What Is The Intellectual Cost of The Pro-Choice Position? In recent months a major political and moral shift has been underway across America. The legality and morality of both infanticide and murder are actually being debated. But not under those terms. No, euphemisms are being used to obfuscate what is truly at stake- the lives of millions of people- your children's lives, your grandchildren's lives, for generations to come. If we continue to ignore this debate and do nothing, we do so at a severe intellectual, moral, and personal cost. This post will help you see through the intentional obfuscation of those who are actively attempting to deceive you into supporting these atrocities. The debate over infanticide and murder are logical extensions of the debate over abortion. On one side, people argue that terminating a pregnancy (up to and including while the mother is in labor) can be justified (the "pro-choice" position), while the other side argues that there exists no such justification (the "pro-life" position). The pro-choice advocate gets emotionally heated because they believe that a mother has the right to exercise autonomy over the life of her unborn child. The pro-life advocate gets emotionally heated because they believe that no human, including the mother, has the right to exercise autonomy over the life of any unborn child. In the midst of the emotional exchanges, some advocates on both sides attempt to take a more objective approach and provide evidence for their position in an effort to bring a logical resolution the debate. If one side is successful in this goal, then their emotional responses may be justified by the evidence, but if that position is not justified by the evidence, then the emotional responses (and the position itself) is not justified and logically must be abandoned. The abandonment would include all laws and legal decisions that support the position as well. Today, I want to take some time to examine the available options and see how they square with reality and experience. Is Abortion A Matter of Opinion? I take the position of being pro-life. I do not hold this position to be merely my opinion that is only "true for me;" I hold this position to be objectively true, whether anyone believes it or not, and that it applies to all people in all cultures at all times. Not only is this a matter of fact position; I have the evidence to establish that this position accurately reflects reality and should be held by others as well. In my discussions with pro-choice advocates, they will present any and every way they think may get them past the pro-life conclusion. Many of them believe that they can choose (true to their label) any number of ways to escape the pro-life position. Do they succeed? I believe they do, but it comes at a steep price. Today I want to present four options that the pro-choice advocate has to choose from in their effort to maintain their position in opposition to mine (the pro-life position), but I wish to also show that the cost is too high for any of the options to be reasonable or desirable. If the unborn are human and if it is immoral to take the life of an innocent human, then it is immoral to take the life of the unborn (abortion). Simply stated, the unborn are human (component #1 is established by science), and it is immoral to take the life of an innocent human (most people agree with component #2 and evidence it in numerous ways), thus it is immoral to take the life of the unborn (the conclusion). This is a valid, logical argument (component #3- modus ponens). Every one of those options denies some feature of the world we live in; they violate the reality we all experience. The first violates what we know to be objectively good. The second violates nature. The third violates humanity. And the fourth violates logic. Of course, none of those options is mutually exclusive (more than one can be chosen), but is any combination of those options really desirable? I mean, who wants to be immoral? Who wants to be anti-science? Who wants to be anti-human? Who wants to be illogical? And who wants to be more than one of those, much less all four? The reality is that no one really wants to be any of those. For The Love of Truth, Is there Another Option?! Being pro-life is the only moral, pro-science, pro-human, and logical option available. Further, the pro-life position, contrary to the pro-choice position, is the only option that preserves the right of the little woman in the womb to make her own choices and exercise her own bodily autonomy in her life. This is precisely what the pro-choice position aims to do but ironically fails to accomplish every time an abortion is executed. The pro-choice position cannot avoid violating the right to choose of the women in the womb. Many pro-choice advocates will accuse pro-life advocates at this point of being "anti-woman." However, I must ask this question: if limiting the liberty of a woman is "anti-woman," then what is killing a woman before she even has a chance to taste liberty? The pro-choice position is self-defeating and self-destructs no matter which direction its advocates attempt to argue and no matter which of the previous options is chosen. No one has ever claimed that choosing life is easy. In fact, it can be down-right difficult emotionally, financially, and physically. Being on the side of truth is rarely easy. False views must be easier, relatively speaking, than the true view; otherwise, they have no appeal. Those who value truth over increased difficulty and are willing to deal with increased difficulty for the sake of truth have a daunting task on their hands when the difficult situations arise regarding pregnancy and an uncertain future for both parents and child. For those who are pregnant and are willing to accept difficulty for the sake of truth, numerous options exist to help with the various difficulties that will arise. I go through just a few of them in my post "Providing The Case Against and Solutions for Abortion." I encourage you to investigate the options and choose which ones best fit your needs and goals. Talk with friends and family, who also value truth, so that they can help share the burdens and carry you through. If Christ has not been raised from the dead, there is no forgiveness for any sin, including abortion, and there is no healing from it. 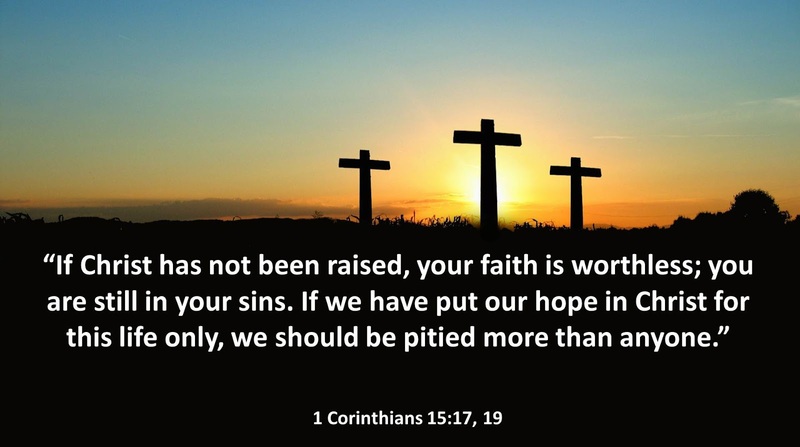 The Apostle Paul had committed murder before he met the risen Jesus, yet Paul was granted forgiveness for his sin by Christ. Jesus' resurrection, as with the pro-life position discussed throughout this post, is not a matter of opinion; this historical event has been established as a real event through the evidence (see "The Risen Jesus and Future Hope" by Gary Habermas). Because of the evidence, you can be confident that Jesus' Resurrection, and the promises of forgiveness, redemption, and healing are not mere platitudes to give false hope but that they are real and are offered to you by the Creator of life, Himself. No matter where you are, if you were once pro-choice but have now chosen to take the pro-life position, it not only leads to truth and life for the unborn, it leads you to the Giver of Life and eternal Life through Jesus Christ. It is pro-Life to the fullest extent.